Following a 2-0 defeat for City at Villa Park in the final game of 1991/92, Notts County's 2-1 victory over Luton condemned the 'Hatters' to relegation. The Sky Blues survived to become one of the inaugural members of the newly formed 'FA Premier League'. For the opening day visit of Lennie Lawrence's Middlesbrough the match day programme displayed new City manager Bobby Gould stood on the Highfield Road pitch with the Spion Kop over his shoulder. At a cost of £1.20 the programme listed the referee as Howard King from Merthyr Tydfil with Uriah Rennie one of his linesmen. Inside the front cover 'Club Officials' were listed, 'Vice-Chairman' was Bryan Richardson while Graham Hover was 'Club Secretary'. Former players who worked for the club included George Curtis, Brian Roberts, Trevor Gould, Barry Powell and Ray Gooding. On this landmark day for football Oggy wore the number one shirt as his back four comprised Terry Fleming, Kenny Sansom, Andy Pearce and Peter Atherton. Last season's 'Player of the Year' Stewart Robson anchored midfield with Lee Hurst while Michael Gynn and David Smith provided ammunition for Robert Rosario and new signing from Swansea City, John Williams. On the bench were new signing from Bradford City, Phil Babb, and the combative Sean Flynn. The prize for winning the previous season's 'Lucky Programme Competition' was a Peugeot 106 while £1,000 was the weekly prize in the Sky Blue Executive Club. Managing Director George Curtis was pictured as he presented club historian Jim Brown with a cheque for the above amount. 'Bits 'n' Pieces' advertised Coventry City Clubcall at just 36p a minute while mascot for the day was nine year-old Luke McCormick from Wyken - Oggy was his favourite player. Bobby Gould was pictured with Willie Boland and his family as he welcomed the 17 year-old from Limerick who signed professional forms while the spotlight feature was 24 year-old John Williams, the Rumbelows Sprint Challenge winner whose speed earned him the title of the 'Flying Postman' prior to his move from South Wales. The previous summer had seen farewell to Dean Emerson, Kevin Drinkell, Don Howe, Paul Furlong and Clive Baker while Phil Neal became Gould's number two. Brian Roberts returned to the club as reserve team coach, goalkeeper Jonathan Gould signed from West Brom while also new to Highfield Road were Babb and Stuart Bowen. Kit manufacturer Ribero advertised their range and used City stars as fashion models. Lloyd McGrath wore leisurewear while Andy Pearce and his Simon Cowell-esque jeans rivalled the shell suit of Peter Atherton. 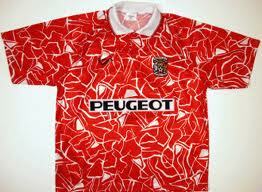 Replica shirts cost £28.50 while the shell suit retailed at £65.00. City won their first match in the FA Premier League 2-1 with goals from John Williams and David Smith - Williams' strike after nine minutes second only to Brian Deane's opener for Sheffield United against Manchester United at Bramall Lane. The Sky Blues won their first three matches and became the first outright leaders while Michael Gynn's missed penalty at Tottenham three days later was the Premier League's first failure from the spot. Bobby Gould can now be heard regularly on 'Talksport' and writes his regular column in the Coventry Telegraph. Three months into the campaign he signed Mick Quinn for City and the rest is folklore. Phil Neal went on to succeed Bobby Gould as City manager and signed Dion Dublin. He was replaced by Ron Atkinson early in 1995 and went on to manage Cardiff City before working in television and radio. Uriah Rennie went on to become one of the most well known referees in the Premier League until he retired in 2009. Bryan Richardson moved up to Chairman and spent the club's money as if it was his own - he was removed from his post as was Graham Hover in late 2001 and left City £60m in debt. None of the 'Club Officials' listed are still with the club. Coventry City Clubcall is no more while mascot Luke McCormick is currently Plymouth Argyle's goalkeeper. Willie Boland went on to appear 72 times for the Sky Blues between 1993 and 1999. 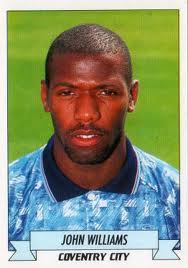 He also played for Cardiff City and Hartlepool with distinction, as he had done at Highfield Road. John Williams appeared 86 times and scored 11 goals for City before he moved to Wycombe Wanderers soon after Big Ron arrived. In his second game for City he scored both goals at White Hart Lane in a 2-0 win. Kit manufacturer Ribero provided kits for Norwich City and Brighton in the same era. City remained (as we all know) in the elite division until May 2001, only Arsenal, Aston Villa, Chelsea, Everton, Liverpool, Manchester United and Tottenham Hotspur have competed in every season from the original 22 teams.